Who sits around checking the WDFW website looking to see if the drawing has happened yet? Well there is way to check and see before you know what you have drawn; it’s been called the ‘backdoor’ approach. So when I noticed I had drawn a Quality Deer tag I was overly excited….since it has been a 13 year journey for me putting in. They only allow you 2 choices for this tag so it was a 50/50 chance what tag I would get. First choice and I’m stoked. My buddy, Cody, hunted it the last season and we started looking over the map. We made a plan to hunt the last 5 days of the season and in hopes the snow would be sticking. Of course, we had months to wait for this adventure but thinking about Mule deer hunting in the rut was just too much for me. I searched websites, asked people I knew and dreamed about a 170-180 buck. Summer came and with that so did the wildfires. Noticing that the unit was on fire, I called a buddy, Jerrod, which lives up there and asked him if I should try and get my points back. He told me to hold on to it, instead of hunting deer hanging around the food we would have to catch them traveling through to food. So did my dreams of finding does and looking for a buck that was courting them went up in smoke with the feed. I would have to say that 90% of the unit burned up. A couple of months before the season were to start, about end of September; the firefighters got it contained and finally out. Cody’s dad took a drive around the unit and gave us some intel of where the food was. I called Jerrod and he reassured me that we would get on a nice buck. He told me he would keep an eye out for one and call me to get there as soon as possible. So the plans could change at any time…and they did. Jerrod called me the day before the season was to start and told me there was a buck in the unit. He told me he would call in about 4 hours to get up there if the buck sticks around. At this point I was on the phone to Cody to let him know that we could be leaving in 4 hours. So he started packing, taking his time knowing he had 4 hours to pack. Two hours later, Jerrod called to get up there. So in a panic I call Cody, which in turn caused him to go into a panic. He wasn’t close to having his laundry done. Road trip up north was on for Cody and I. Weather was good all the way up but now snow. Got into the hotel room and called Jerrod. He told us that he would meet us in the morning outside the hotel. Sunday morning was here and now getting the stuff ready to chase a big buck, Oh we still have to drive to the spot where the buck was last seen. To make this shorter, we looked for him for 3 days. Not one eye was laid onto him…He had vanished. We did see lots of bucks but nothing to chase. We did spot a nice 3 point, he had some mass and you could fit a beach ball in his antlers. We saw him every day we glassed that hillside. I think he was tempting me to go after him. And he did a good job of it. I figure if we didn’t see anything bigger he was going to be a last day buck. 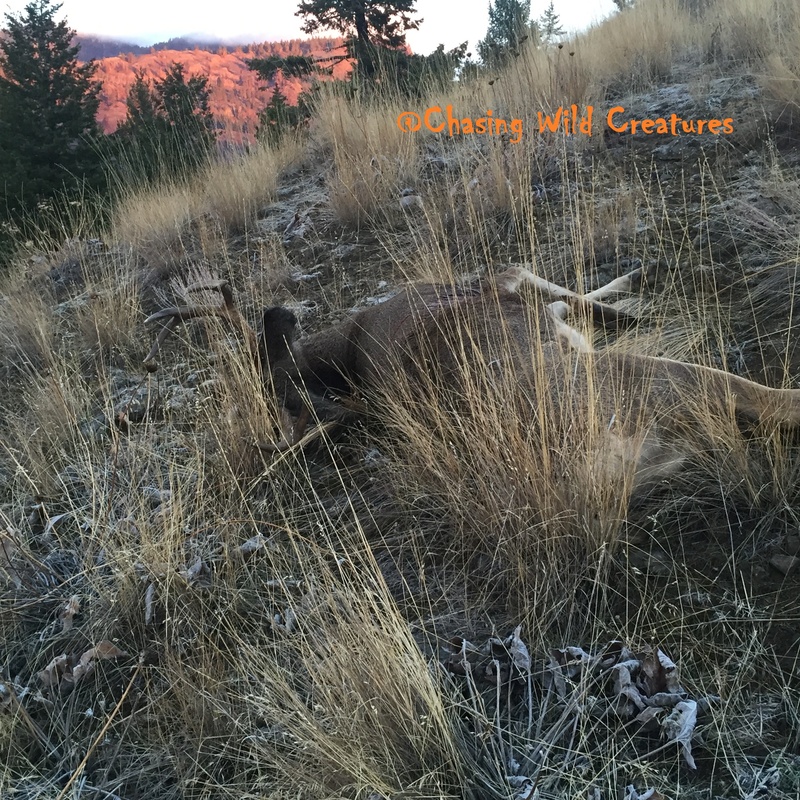 We changed up our location one evening to see if that big buck was in another valley. We spotted a couple of different bucks but not the big guy. 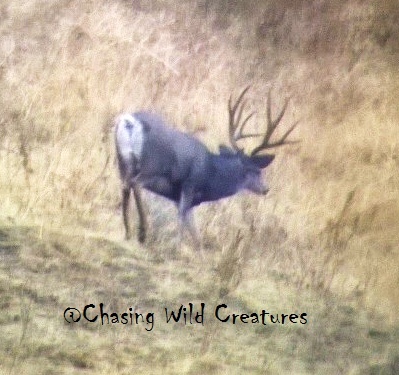 One buck we saw was a very tall 2X3, but narrow and not on the hit list. Darkness fell and back to the truck we went. Jerrod, Stumpy, Cody and I talked that we needed to be in the same spot before daylight. He might just come out first thing and then head back into a canyon. We all agreed that it was a great plan and headed back to our places for the evening. Cody and I stopped to fill up with gas and get something to eat. Wednesday morning found Cody and I stopped at the local convenience store for coffee and donuts. We met up with Jerrod and Stumpy. The short 20 minute hike in and the spotting scopes came out. After a few minutes of glassing Stumpy spots a nice buck. Spotting scope revealed a nice 4X4 with mass. 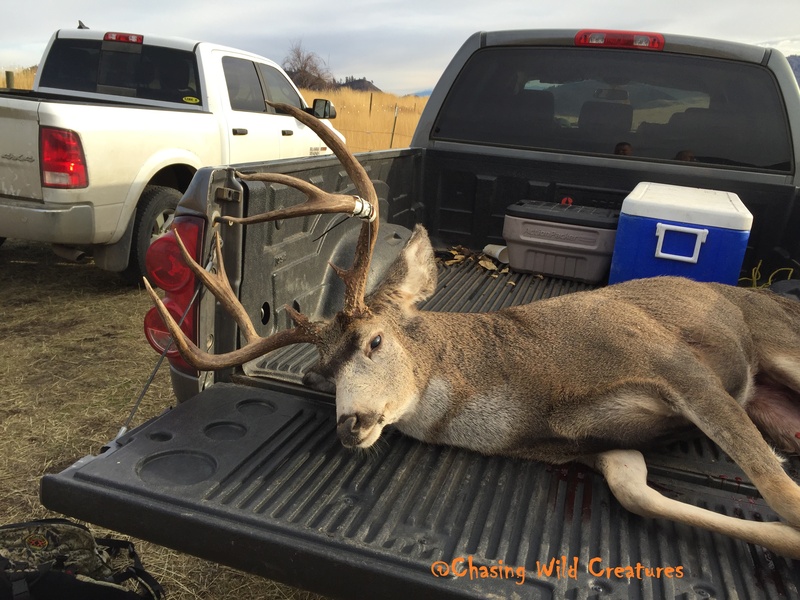 I said that is the one I want…Jerrod said, ‘Give me 15 minutes to find the bigger buck.’ I couldn’t even look at him through the scope because I knew that would and did drive me crazy. Jerrod finally said, ‘let’s go kill that buck.’ He was about 680 yards away and on the other side of the valley. We (Jerrod, Stumpy and I) made our way down and across the valley. Cody stayed to keep an eye on the quarry. Halfway through the valley the buck spotted us, there was no way to hide from him. The quarry was on his way out but then ran into some does…which was his fatal mistake. Hurried to a rock cropping and set the 280AI down, I checked my ballistic table while Stumpy or Jerrod ranged him. 340 yards was called out and I went back to my ballistic table. Crosshairs settled on him just behind the front shoulder and a doe walks in front. Then he was facing us…’come on just turn’ went through my mind. 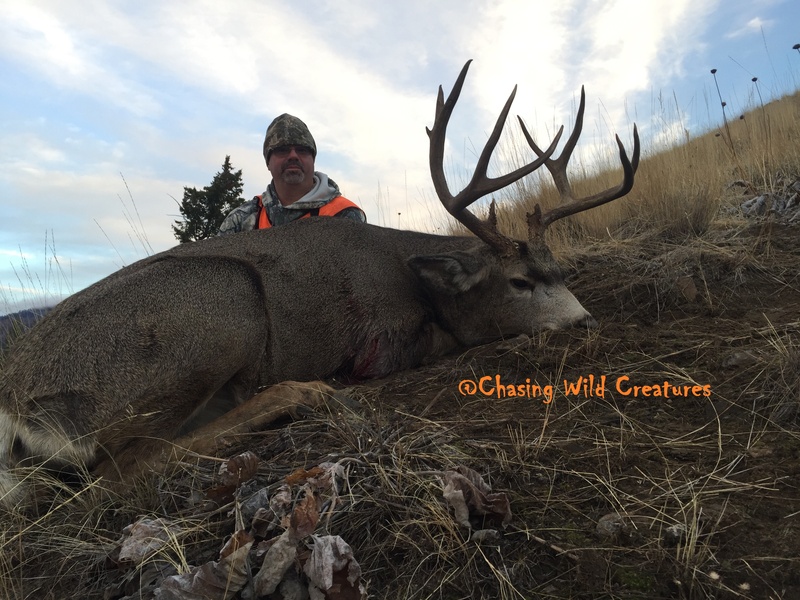 He started walking to the left and came to a stop, crosshairs settled again and the rifle barked out loud. Next thing I hear was Jerrod saying ‘he’s hit and going down’. After catching my breath and realizing what I just did my emotions started to show. After the hugs and high fives we waited for Cody to make his way over. Hiking up to get my hands on the buck the emotions from all of us and what just happen came out. I think when I saw him lying there; I realized my 13 year journey was not quit over. The biggest buck to date I am holding in my hands. A little prayer to thank the animal, my friends and the big guy in the sky was said. Lots of pictures, lots of admiring the buck and now to field dress him. 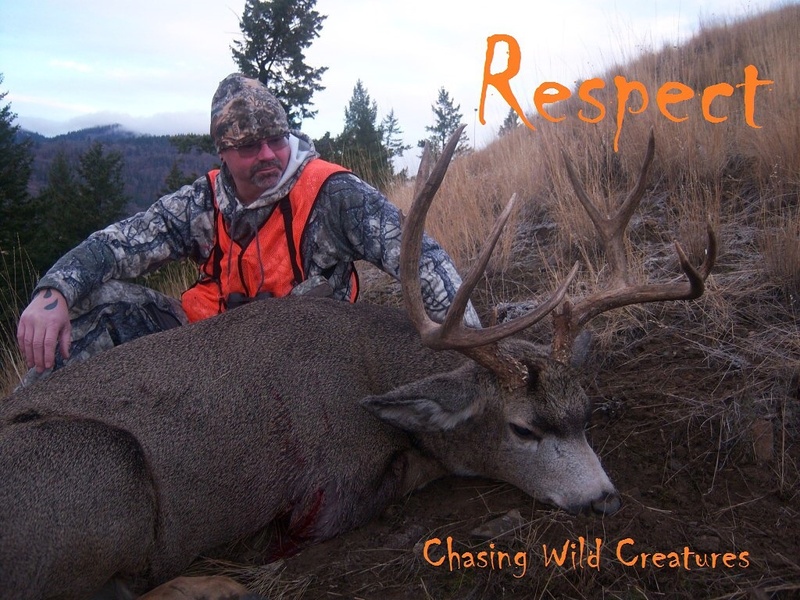 My Trophy has been hauled out and into the truck, Jerrod and Stumpy caped him out for me since I have never done it. I didn’t want to mess it up since I knew he was going on the wall. Now in the game bag, we all head into town for some breakfast. We say our good byes and I thank Jerrod and Stumpy for all their help. Cody and I decide to head back home, checked out of hotel and antlers tied in just high enough that people who knew what they saw would give us the thumps up…it worked. We made it back just in time to drop the meat off at the butchers. Next morning we drop the head and cape at the Taxidermist. We chatted a bit and then decided that a Semi-sneek to the left is the mount I would go with. 16 to 18 months to wait…I guess I will have too. This hunt was just one dream I had that came true. It was awesome to spend the time with friends and have them there for this quest. I set out to shoot a 190 buck that we never got eyes on, ended up shooting a 150 buck which I’m very happy with and grateful. This hunt started out as a burnt up unit and not knowing what to expect; in the end, it turned out to be a bunch of friends enjoying the harvest of a trophy buck.